There’s no one out there that’s smarter than we are, just people that know more than we do. Today’s letter comes from T.J. Valdez, a Chandler Arizona husband, father of X (Xavier- 11), Kira (8) and Lucas (4), and is the brother of our very own Steve Valdez. 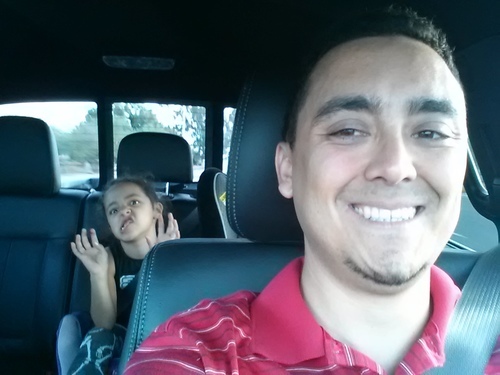 I appreciate the opportunity to contribute to this blog, because I truly identify myself first and foremost as a dad. After my first was born I told my dad that I never understood how much he loved me until I had one of my own. Now my beautiful, intelligent, and patient wife and I have three: Xavier (11), Kira (8), and Lucas (4). We make our home in the Phoenix area and are your typical way-too-busy-but-wouldn’t-have-it-any-other-way family. Between cheer, soccer, school, and other chaos I try to sneak in a the occasional sporting event, even if it’s on TV. Especially if it’s baseball. I love baseball. I’m not going to lie. This is my second attempt at this letter. The first had a lot of good advice in it, but it just wasn’t making a lot of sense so I decided to hold off on that one until I was asked to write one of these again (or maybe I should say “if” I’m asked to write one of these again, after all, I think my letter to you was supposed to be posted on the site today (Sunday) and it’s already 8:14pm – sorry Ralph). You guys know this already, but I like to cook, and usually from scratch. I’ve also tried to teach myself how to sew, how to play guitar, graphic design, mixology (you don’t get to learn that one for another few years), gardening, and how to make a trebuchet. Some of those things were great successes (I know we all cheered when we were able to launch a Reece’s Piece across the kitchen with our tabletop trebuchet). And as for some of the others… well, let’s just say I could definitely use some more practice (thank you guys for being nice enough not to leave the room, house, city, or state when I try to play my guitar). I’m not writing this to try to get you guys to realize what an awesome dad you have (hopefully you already realize that! ), but instead to encourage you to always be curious and always know that the ability to do anything is always at your fingertips. Let me tell you a quick story. Kira, we were at your 4th birthday party at your preschool. I was sitting with your soccer coach, who completely coincidentally happened to also be your preschool teacher’s sister’s husband (Got it?). And if you haven’t figured it out yet, he also (again, completely coincidentally) went on to be X’s 5th grade teacher three years later. So Mr. Buist and I were sitting at Kira’s birthday party and we were talking about this very point – a person’s ability to do anything. He said something to me that may sound weird, but if you think about it, it makes a lot of sense. He said “There’s no one out there that’s smarter than we are, just people that know more than we do.” His point is that you really can do anything you set your mind to. I know that sounds like advice you’ve heard from every grown-up ever, and it has probably lost a lot of its meaning because of that. That’s why I bring up cooking, guitar, and trebuchet building. I want you to understand that “you can do anything you set your mind to” aren’t just words. It’s not just a thing grown-ups say to try to make you feel better when you fail at something. It’s actually true and I have real life examples. Heck, I try to be a real life example of that. Think of the best cook you know or maybe your favorite chef on TV. Do you think that person could cook like that as a kid? What about the best guitar player or singer? Do you think Taylor Swift was playing this well when she was 8? All of them had to learn. And you can learn too – and so can I. Why? Because none of those people are smarter than we are – they just know more. Alton Brown has learned more about food than I have. But I strive to learn as much as I can, and if I dedicate myself to it, I can cook like Alton Brown. The coolest part: SO CAN YOU! So what’s the secret to doing anything you want? It’s just that: wanting to. Like I said before, stay curious. See things that you think are cool. Want to do them too. Then, if you really and truly want to do something, if you want to learn how something is made/done, you can find out and you can learn to do it too. And that’s kind of awesome when you think about it. YOU can cook like Alton Brown. YOU can play guitar like Taylor Swift. YOU can make your own dresses or shirts. After all, what does anyone else out there have that you don’t? Experience, maybe? That’s easy enough to go get. Find something that interests you. Find 100 things that interest you. Learn how to do them. Learn how other people do them. Do them yourself. Make mistakes. Learn from those mistakes. Do them again. Do them better. Keep doing them. Learn. Be curious. Explore. Why? Because you can. I know you can. And your mom and I will be right there to help you anytime you need it. I love you guys, always and no matter what. Great thoughts TJ, thanks for sharing.